A new member at www.5thgen.org joined and posted these two images of a Camaro SS on a movie set! These are the best images we have seen yet. Visit the thread on 5thgen.org to see what he has to say about his find. Click the images below for the full size version. This video needs no introduction. One more reason to visit the Bowling Green, Kentucky assembly plant for a tour if you have never been. DIAMOND BAR, CA--(Marketwire - June 17, 2008) - The 2010 Chevrolet Camaro, a true 21st century sports car, will be the official vehicle of the 2008 SEMA Show. Held Tuesday-Friday, Nov. 4-7, 2008, in Las Vegas, NV, the SEMA Show is the world's leading automotive accessories trade show. "The influence that the Camaro has had on the automotive industry and vehicle personalization is undeniable," said Peter MacGillivray, SEMA VP of events and communications. "Since the car was introduced in 1967, enthusiasts have fallen in love with the Camaro. It's simply a great example of the passion and excitement that comes from this industry." After 35 years of continuous production, the Camaro was taken off the assembly line in 2002. Chevrolet introduced a concept version of the popular vehicle in early 2006, announcing later that year that a new generation of the Camaro would be forthcoming. That vehicle is set to debut in 2009. Posted on the GM Fastlane blogs today! Looks out of proportion in these shots, I'm sure the real deal looks much better. Car looks good with the top up too. I'm sure more shots are forthcoming. Another car to be built at Oshawa? DETROIT, June 6 (Reuters) - General Motors Corp ( said on Friday it was in very early discussions with the Canadian Auto Workers union about adding another model to its car plant in Oshawa, Ontario, after deciding to close a nearby truck plant. 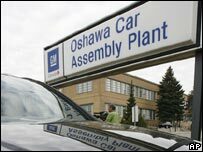 The discussions about a potential third car for the Oshawa car production line, earmarked to make the Chevrolet Camaro and a still unnamed second car, began this week after GM announced it was closing its truck plant in Oshawa, said Stew Low, a spokesman for GM Canada.